I’m delighted to announce that my partner, Manuela, gave birth to a baby girl in Tralee General Hospital. The time of birth was Saturday, May 9th at 8:52pm. We’re going to name her Róisín Elena – the Elena for Sant’Elena, the island in Venice where my partner was born. The new baby weighed 3.3kg, and was quite tall. She barely fit into her newborn clothes. It was a long labour, but all was well in the end. We’re both delighted! I can go to bed happy. I just wanted to say thanks to all the people who have wished us well over the pregnancy including our families, our friends, our customers, the people following over on Twitter and the readers of this blog! There’s new little ice cream eater in this world! And if her mother and father are anything to go by, she’ll have some appetite! Oh Kieran, she’s absolutely adorable! Just perfect! Congratulations to you both! It’s Mother’s Day here in the States so Happy Mother’s Day to Manuela! Congrats to you both!! Baby is absolutely gorgeous!!! 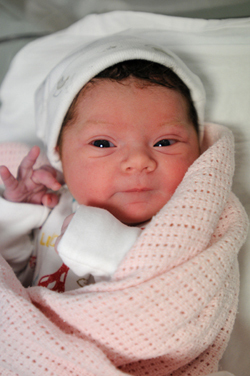 Congratulations to yourself and Manuela – she is just beautiful! I love then name Elena too! Wow! She is absoultely beautiful and so calm and peaceful, just taking it all in. It must be a sensory overload for new borns, from the warm red place out into the world of bright lights! Enjoy every second of her newness! I am thrilled for you both! Enjoy every moment. Am I wrong or is she already oredering her first scoops in the top picture? congrats to all of you……so very happy for you guys…..
What wonderful news. Huge congratulations! That’s great news – congratulations to you both! Time will fly from now – my own Little Missy is six weeks old already and thriving. Enjoy yourselves! Many, many congratulations to you and your family. Congrats Kieran and Manuela – she’s beautiful. My most sincere congratulations! She is cute as a button. Very happy for you both. Oh she is such a cutie. Congrats to you both and welcome to little Róisín. Comhghairdeas Go maire bhur mbabaí a shaol úr. Also wanted to say your photography skills are amazing, you’ll be so glad you mastered the art before your baby came into being. I kick myself for not starting sooner when I see Jasper’s newborn pictures.